The ancient belief that birds begin to build their nests on the feast of St Valentine has immortalised the name of the saint into popular folklore. By the time of Chaucer, it was already the custom for young men and maidens in England to choose each other for “Valentines” on February 14. In France, the feast was marked in the Medieval period with jousting tournaments and recitals of amorous poetry. So just who was St Valentine and how did he come to be the patron of lovers? There has been speculation that February 14, when Roman Christians honoured one or more saints of this name, fell around the time of Lupercalia, a Bacchanalian festival of sexual activity which was later Christianised. Nevertheless, the Roman Martyrology speaks specifically of a St Valentine who was just 20 years old when he was consecrated Bishop of Terni by St Felician of Foligno in 197 on the orders of Pope Victor. For 73 years, this St Valentine built up his diocese in the face of persecution, continually visiting Christians jailed for refusing to renounce their faith. He was eventually himself imprisoned in 270 during the reign of Emperor Claudius II “the Goth” and during his incarceration was said to have healed the daughter of a prison official, resulting in the conversion of the gaoler and his family to Christianity. On 14 February 273 St Valentine, aged 93, was decapitated on the Flaminian Way on the orders of Furius Placidus, the prefect of Rome. The saint is described in his acts as a brave, righteous and wise man, and an affectionate and conscientious friend to those in need. According to tradition, St Valentine cared deeply for the young: he taught sweethearts to read and write letters to one another, made presents of flowers to newlyweds and was always ready to reach out a hand to married couples in difficulties. How much of this is truth or legend is, like many ancient hagiographies, impossible to say. It may be a mixture of both. For instance, one unlikely romantic story involving St Valentine tells of how he presided over the marriage of Serapia, a Christian, to Sabino, her pagan lover. Serapia soon died and her grieving husband asked God to grant him the gift of death so he could join her in the grave, which was generously granted through the intercession of St Valentine. What is known to be true, however, is that an active cult grew very quickly around Valentine after his martyrdom. A church was soon built in his honour on the site of his execution and it was later enlarged into a basilica with three naves and a crypt. This was destroyed in the Dark Ages but long before then the saint’s bones had been hidden away in the Catacombs of St Valentine. There they stayed until the 18th century when they were rediscovered along with the remains of hundreds of other Roman saints and martyrs. The Holy See was faced with the problem of what to do with such esteemed relics because there was not enough room in the Roman churches to venerate all of them. It was decided that some would be sent as gifts to the Catholic monarchs of Europe. Ss Valentine and Pantaleon were shipped to Spain as a gift to the Spanish monarchs and others were taken to Austria, Germany and France. 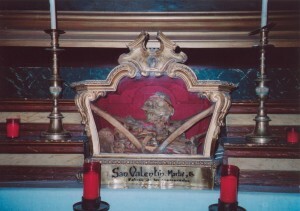 Practically a full set bones (pictured above) said to belong to St Valentine were placed in the custody of the Royal College of San Anton, Madrid, and kept in the sacristy of the adjacent church of the same name (Blessed John Henry Newman also brought some of the saint’s purported relics to Birmingham). In 1936 they were secreted away once again, this time from Spanish Communists during the Civil War. They were rediscovered some 50 years later by Father Francisco Martinez Villar, then parish priest of San Anton, who in 1986 put them on public display for the first time in centuries, where they remain.